June 6 was an historic day to No. 45, Kynsey Road, Colombo 8 as the Archdiocesan Social Communication Centre (ASCC) was a great feat of His Eminence Thomas Cardinal Cooray, in the mid 60s. After the second Vatican Council.Where ever he put his hand into, the end was a great feat. Because he was so great! His eminence was a communicator to the core. He knew the validity and the length and the breadth of this massive empire. He finished constructing the hollow edifice and entrusted to draw up the blue print for a professional sound studio to a broadcaster who had inborn talent to do great things either before the studio microphone or the TV camera. He was calm so was his soothing voice. He could not accomplish the task God decided otherwise, that was Fr. Joe Nettesinghe. 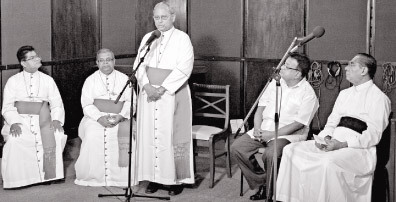 His eminence Cardinal Cooray who was the initiator and the prime mover of Radio Veritas which has chalked up over 40 years to date, was contemplating entrusting Radio Veritas to Fr. Joe Neth but the Cardinal changes his strategy and identifies a another creative and a capable young priest to continue from the point his predecessor halted. To design a modern studio in those dark hollow spaces was not an easy task. He was new to the task. Weeks and months passed by, the edifice changed in its soul. Fully equipped audio Studio comes to be adorned with the latest Swedish Studio equipment. Fr. Rufus christened the social communications centre as Joeneth Studio in undying memory to a great broadcaster of the Catholic Church. Now it was time to find a capable technician to work on the brand new equipment to meet musicians to work with them to mix and edit the music renderings and to come up with the final product. Fr. Rufus went in search of a technician for the future. Donald Ivan a rustic young lad who was putting his hands into motor winding and other areas of the Radio Lab at Kotahena. The eyes fell on this lad. The question was could he be a suitable candidate for the task? Fr. Ignatius Perera cannot make a mistake. He was a wizard in the technical field, things so nicely clicked and he said he is the man. In no time Joe Neth popularly known then as ‘Bishops’ became a household name. It grew up that fast that to get a date for a recording at that time, the client had to be in the waiting list for over three months. No doubt that we were on top most rung. Archbishop Dr. Nicholas Marcus too was on the alert of the happenings in the media world and his responses were well accepted and his contribution towards the Church Communications must be appraised. Working with him was very pleasant and rewarding. In his retirement in that beautiful and serene setting under the shadow of the Basilia, I am sure with so many pleasant memories social communications centre too has a place. His Grace the Archbishop Dr. Oswald Gomis has carved a niche in the edifice of Church Communications locally and in Asia. His clarity in communication has earned so much honour and prestige to the local Church. His pioneering involvement in Radio Veritas has enabled for it to march forward with durability. 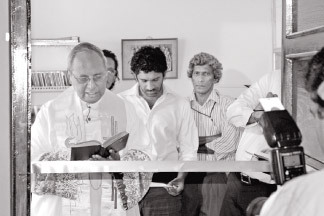 It should be noted here that during his tenure as Archbishop of Colombo the investments made were for the development of the studios, we are so grateful for. I must admit that I owe a huge debt of gratitude to Fr. Rufus Benedict my guru who showed me the way. After my first tenure of office Very Rev. Fr. Cyril Gamini becomes the Director and did shine as a media professional. So is he today, Fr. Sriyananda Fernando succeeds Fr. Gamini, a bundle of talent simple and unassuming. His musical talent enabled him to put his mark in the arena of communications. Today we have arrived at a critical era. The media that we were accustomed to see and hear is fast disappearing. Olden day categories the nomenclatures are outdated. New technologies have taken over from all sides. Media has taken a commandeering position in many areas. We cannot compromise today. We have been necessitated to face the brunt of it. And respond fairly and squarely. The social media is revolutionizing the entire world. If I may turn to our Communications centre, as far back as 1972 our studio had mono system, in the 80s we switched on to Stereo system, now it is digital and more. There is so much of competition and new modes of communication. The Church has to manage her affairs being in the thick of this scenario. Our approach has to be professional and well established. It is at this juncture His eminence Malcolm Cardinal Ranjith threw the challenge to us who are in the field of communications and directed us to see to the feasibility of a Catholic Radio Station to start with. Our request was made to the higher authorities but it was of no avail. While we pursue this we thought that we shall embark on an online radio joined to our website since time was running out. On June 6, we entered into the cyber space. 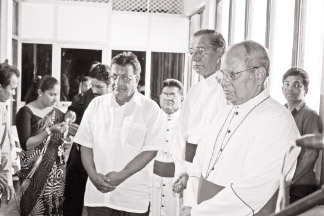 His Eminence Malcolm Cardinal Ranjith was the chief Guest and Hudsan Samarasinghe was the guest of honour. 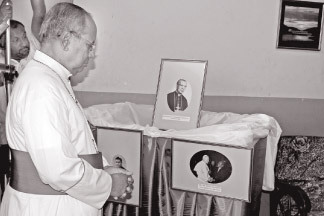 Bishops Emmanuel Fernando and Maxwel Silva were in attendance with a number of priests and other distinguished visitors. After the lighting of the traditional oil lamp His eminence Malcolm Cardinal Ranjith garlanded the photograph of His eminence Thomas Cardinal Cooray and floral tribute paid to Frs. Joe Neththasnghe Rufus Benedict. A Christian united rally organised by the National Christian Council was held at the Cathedral of the Living Saviour to mark the Feast of the Pentecost with all Christian denominations being represented. One of the stirring sermons delevered was by the Baptist Pastor, Rev Bulathsinhala who stressed on the importance of unity among all denominations which lacks today with each going their own way. ‘We must not be responsible for a divided church’ he said, followed by Methodist and clergy representatives who made soul-searching sermons. However, the Catholic church was not represented due to some unavoidable reason hours before the prayer sessions started. 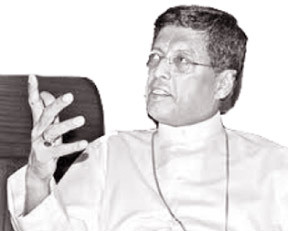 The Auxiliary Bishop of Colombo, Rt Rev Emmanual Fernando was due to speak. The Final Benediction was delivered by His Lordship, Delo Canagasaby, Anglican Bishop of Colombo. In his short sermon, the Bishop said ‘Christian Unity is the crying need of the hour. Why have we to be divided into so many denominations. Why can't we be like family under one roof and not lock ourselves in separate rooms? Because when we come out of those rooms, we all meet face to face with each other under one roof. Christians should never be divided because when we meet God on Judgement Day, we have to meet Him as one family in one faith, never differently'. The Bishop further said ‘I repeat over and over again that Christianity is not a religion but an ongoing vibrant communication between God and all of us, day and night. There should never be a pause to this. We must feel God every minute. His Lordship quoted John 17, 20. 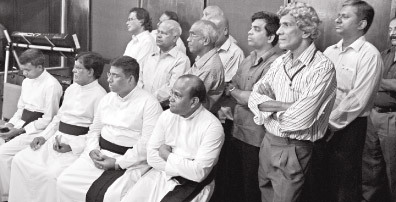 Choirs in English, Sinhala and Tamil from the National Christian Council, Catholic Church and the Evangalic Alliance of Sri Lanka were in attendance. At the end of the candle-lit prayer for a fresh infilling of the Holy Spirit and a new Pentecost in the lives of people, the session ended upon a packed gathering. Corpus Christi was celebrated at St. Lazarus Church Kurukulawa recently. The celebration commenced with Holy Mass followed by the exposition of the Holy Eucharistic Adoration. In his homily at the festive mass Rev Fr Ruwan Deshapriya, staff Loyala College said, “The Holy Eucharist is the treasure of Christian Life. It is in the Eucharist that we find a way of communicating with Jesus. Our bodies can become temples of the Holy Spirit when we receive the Eucharist worthily”. The beautifully decorated chariot carrying the Holy Eucharist wended its way from Thuduwegedera to Kurukulawa for Benediction. On the way, Rev Fr. 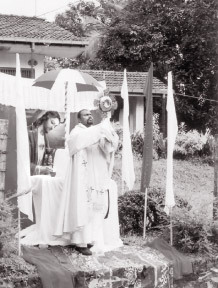 Francis Fonseka, Parish priest of Kurukulawa blessed from the Holy Eucharist in repositories. The parishioners of Kurukulawa and Thuduwegedera took part in the procession with faith, love and devotion towards the Holy Eucharist. “The history of relations between the Church of England and the Catholic Church,” the Pope continued, “is long and complex, and not without pain. Recent decades, however, have been marked by a journey of rapprochement and fraternity, and for this we give heartfelt thanks to God. This journey has been brought about both via theological dialogue, through the work of the Anglican-Roman Catholic International Commission, and via the growth of cordial relations at every level through shared daily lives in a spirit of profound mutual respect and sincere cooperation. Their praying together “gives a fresh impulse to our daily efforts to grow towards unity, which are concretely expressed in our cooperation in various areas of daily life. “I know that Your Grace,” the Holy Father asserted, “is especially sensitive to all these questions, in which we share many ideas, and I am also aware of your commitment to foster reconciliation and resolution of conflicts between nations. In this regard, together with Archbishop Nichols [the Catholic Archbishop of Westminster, England], you have urged the authorities to find a peaceful solution to the Syrian conflict such as would guarantee the security of the entire population, including the minorities, not least among whom are the ancient local Christian communities.